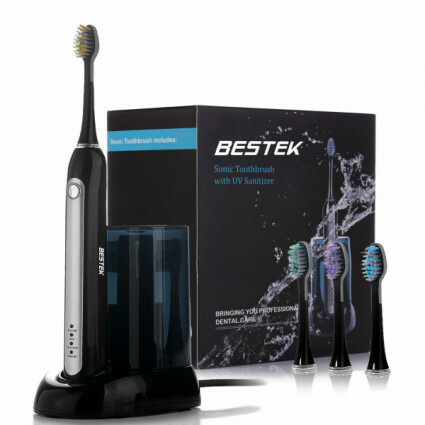 BESTEK Sonic Toothbrush heads have specially designed contoured bristles that provide effective cleaning action while remaining gentle on your teeth and gums. The reverse side features a convenient silicone tongue brush to help eliminate tongue bacteria which improves breath and general health. • BESTEK recommends beginning with soft mode if you are new to sonic technology. • To avoid toothpaste from splashing, please turn the toothbrush on after it is in your mouth and turn it off before removing.